Madill Golf - Page 21 of 77 - Two Sisters. One Sport. One Passion. I’ve been looking forward to this week for a very long time. It’s the 118th playing of the US Open, at renowned Shinnecock Hills Golf Club on Long Island. 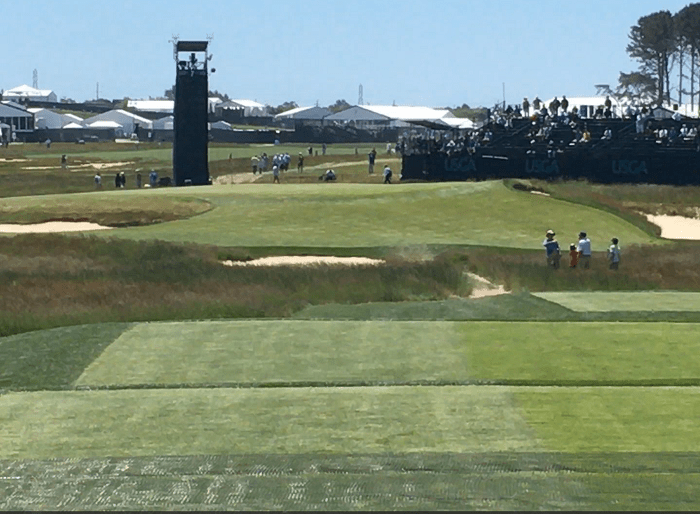 I had my first look at the course on Tuesday, guided round by my Sirius/XM colleague and friend, the experienced broadcaster Fred Albers, who has had the pleasure of playing here a number of times. I liked it from the off despite having to listen to his detailed descriptions of the birdies he had the last time he played. So much about it is reminiscent of the Irish/Scottish courses that populated my youthful amateur tournament play – the tall waving marram grasses and the glorious lack of really tall vegetation, in other words, trees, and of course, the ever present stiff-ish breeze that Dad would have scathingly labelled a mere zephyr. Here is a course and set-up that looks to be testing but fair, examining every aspect of a player’s skill and asking a few questions also of their mental resilience and calmness under fire. This is the fifth time the National Championship of the United States has been held at this venue and a good week is needed to erase the memories of the 2004 edition when the organising body, the US Golf Association, “lost” the greens, the 7th in particular, and had to resort to watering the putting surfaces in between pairings. It was almost farcical but only one man was laughing at the end of the week and that was South African Retief Goosen who scooped his second US Open title in three years. The Redan hole at Shinnecock and the green that needed emergency care in 2004. Retief is not here this week but his caddy from 2004, genial Irishman Colin Byrne, is back and I bumped into him as he was preparing to usher his current charge Rafa Cabrera Bello round the course. He can recall every shot and every putt of 2004 – particularly on the final nine when Retief amazingly needed only 11 shots with the flat stick. “How’s the course playing this year?,” I asked. “It’s tough, very tough,” he said, and I realised yet again that it is not only the players who are tested to the limit – the caddies are too. And that makes me wonder if you can, indeed, overcome a challenge such as this with simply your best buddy on the bag as opposed to a seasoned looper like Colin. (Sorry Rory.) If there’s nothing to choose between combatants coming down the stretch, the marginal gain that can make the difference can certainly be the caddy. So, I like the chances of Rafa with Colin, Justin Rose with Mark Fulcher or Henrik Stenson with Gavin Lord. This test requires a team – and they both need their “A” game. 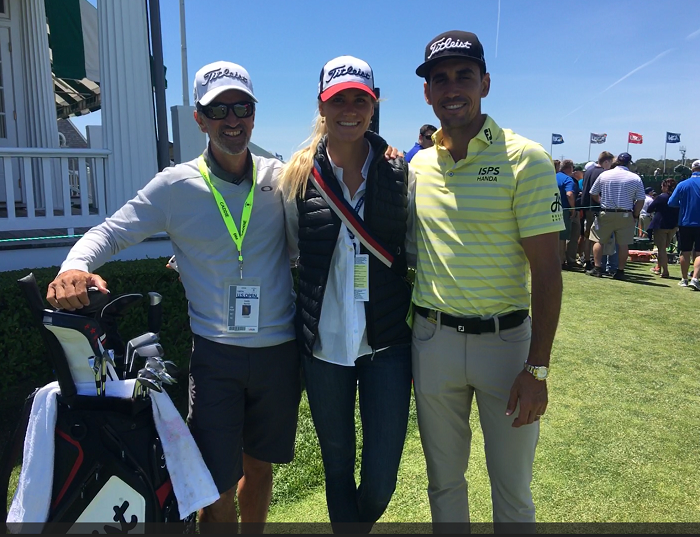 Colin with Team Rafa prior to heading to the 1st tee in practice. 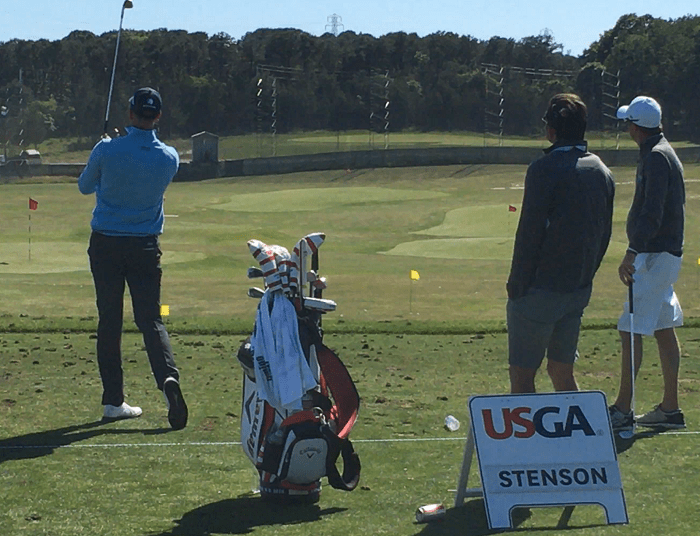 Gareth (Lordy) Lord, far right, keeping an eye on his man, Henrik Stenson, on the range. As the crow flies we are about ninety miles from Quaker Ridge Golf Club, scene of last weekend’s terribly one-sided Curtis Cup match. The final score was 17 points to 3 in favour of the Americans and that included a first ever whitewash in the singles. As I was making my way round during my first recce of the course I was hailed by none other than Valerie Hassett, former president of the Irish Ladies’ Golf Union and former British Amateur Senior Champion and Scottish senior international Fiona de Vries, both of whom had been out to support the teams in the match. They had caught the train from New York to the specially built Shinnecock station and were getting a feel of the place before flying home to catch the action on telly. There seems to be much to ponder after this last contest, particularly the question as to whether the GB&I side should become Europe, as happened to the Ryder Cup back in 1979 at the suggestion of Jack Nicklaus. I may be inclined to go along with that notion although I’m sure it’d meet with vehement opposition. Time to revisit that suggestion after the post mortems are concluded, I think. With Fiona and Valerie, both seasoned performers and steeped in the game. I am often asked for my tip for any major I am attending. I have a 100% record in this – I am always wrong. In fact, I’m wrong in most things, so the Curtis Cup will probably have a good chance of remaining purely a GB&I team and Rafa, Justin Rose and Henrik will all have poor weeks this week and not contend. Ah, so maybe Rory with best buddy Harry on the bag will be striding up the 72nd to victory? Well, I could live with THAT. Couldn’t you? A hive of activity: the media centre abounds with more accurate predictions than mine! It was a blustery, breezy day on a fast, hard-running golf course yesterday and my partners and I handled the conditions better than anyone else, to win the captains’ charity am/am by a single point. 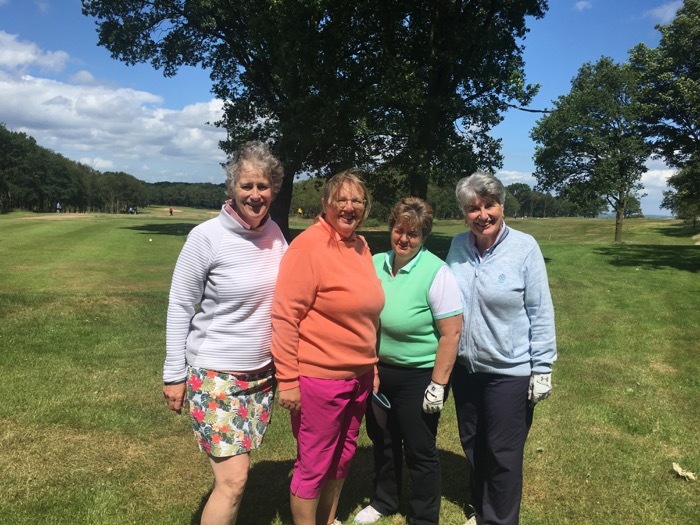 So, well done to everyone who played, particularly for raising a couple of thousand pounds and more for Alzheimers, which is this year’s charity and coping manfully – and womanfully – with the conditions. 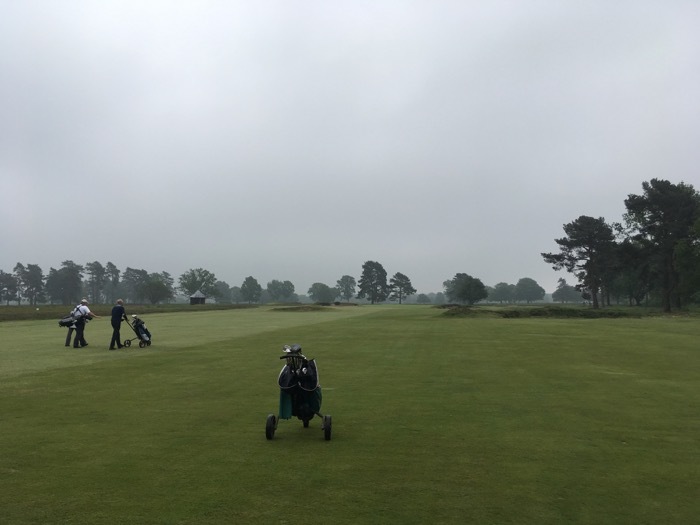 Admittedly, Whittington Heath is not Shinnecock Hills but it is probably more like this week’s US Open venue than most of the courses the pros play in their day to day life on tour. It makes you think; it makes you have to trust your judgement, not just the yardage chart; it makes you assess the camber, the roll, the breeze; and it often makes you hit shots you don’t really want to hit; it makes you mad because not every bounce will go your way; and sometimes it’ll seem positively unfair. In short, it’s proper golf, golf at its most sporty, its most testing, its most irritating and if you get it right, its most exhilarating. I’m not quite sure how I ended up in such exalted company but playing my sixth round in seven days (it was choir on Wednesday) I was easily the least inspired member of the four ball and just watched in awe, mixed with gratitude, as my partners produced the fireworks. Jill Harris, playing off 21, represented England at table tennis in the Commonwealth Games and is starting to get to grips with golf. She had two gross birdies and got on the card (two scores from the four to count) an impressive 13 times. Team captain Susan Sims, a Scot with John Daly’s grip it and rip it mentality, hit some astounding shots and Sue Gartland, working her way back diligently from injury, is starting to look dangerous again as she adjusts to her new physical limitations (bit like Tiger, though think Sue’s putting is better at the moment). We were, I admit, extra chuffed to win because we were the only all female team and, not having been able to go on any of the suffragette marches on Sunday – playing a match at Hinckley – I felt we were at least flying the flag! Bit pathetic I know but every little helps. We lost at Hinckley – good luck to them in the next round of the Taskers – but I’ve never arrived at a golf club in such enjoyable style. The mini, even one of those modern super-sized mega minis, couldn’t cope with three of us plus golf clubs and trolleys, so the camper van it was. Marvellous. Might make a habit of it, it’s such a sedate way to travel – and you can see over most walls and hedges. Thanks to Chris for doing the driving. 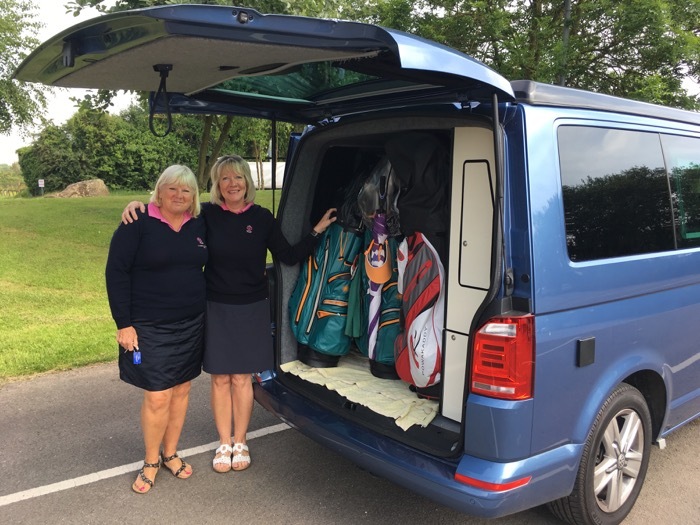 Having arrived in style, Whittington Heathens Chris (left) and Karen prepare to unload the clubs. Although we lost, 4-3, we weren’t disgraced and it was disappointing to get home to discover that the GB&I Curtis Cup team was going down the tubes with barely a whimper. The visitors lost all eight singles on the last day, so congrats to the USA on their victory and back to the drawing board (and the practice ground and the putting green) for the Brits and Irish in preparation for the next match, at Conwy in north Wales, in 2020. Many moons ago now, at Prairie Dunes of blessed memory (give me half a chance and I’ll regale you yet again with the details of that glorious moment in Curtis Cup history), Trish Johnson was a fresh-faced amateur, sweeping all before her as she won four points out of four. An invincible. 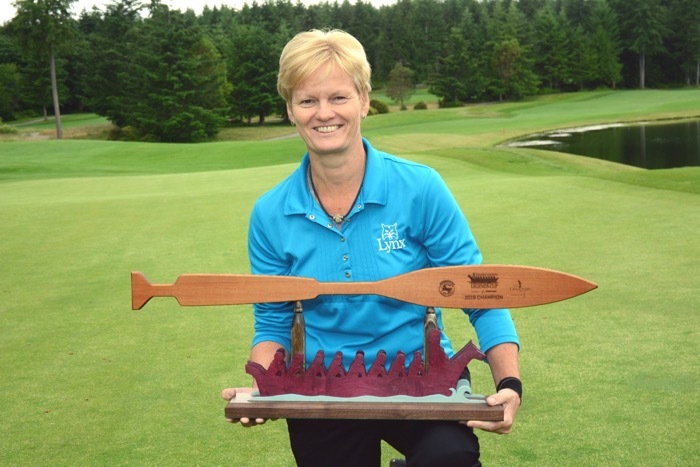 Thirty-two years later, she’s still competing and winning, this time on the Legends Tour, in the grandly named Suquamish Clearwater Legends Cup presented by Boeing at White Horse Golf Club in Kingston, Washington. 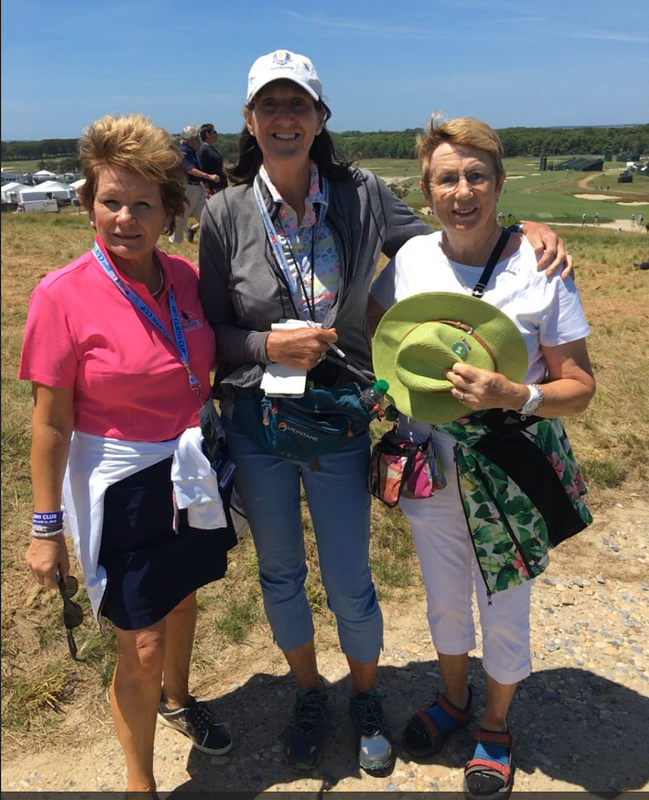 She won by five strokes from Lisa Grimes of Arizona, with Michelle McGann, the Floridian who was known for her hats, third, two shots further back. 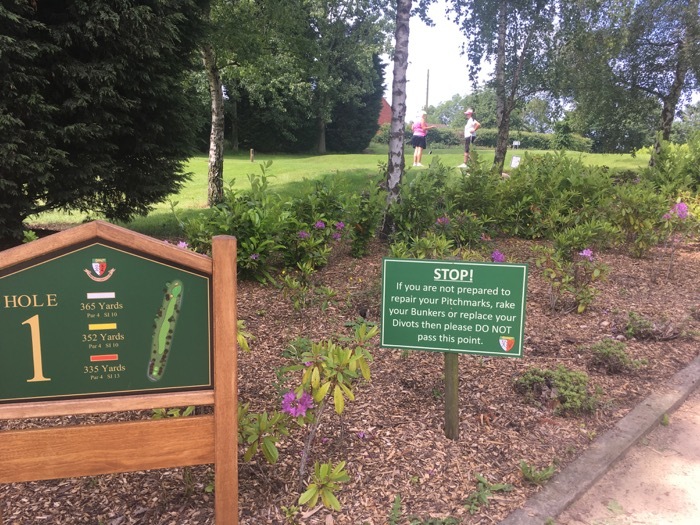 Finally, here’s a photo of my favourite sign of the week, en route to the 1st tee at Hinckley. This made me laugh and I hope it makes everybody think – and care for their course. The season’s now in full swing for just about every golfer, no matter the standard, age or gender. 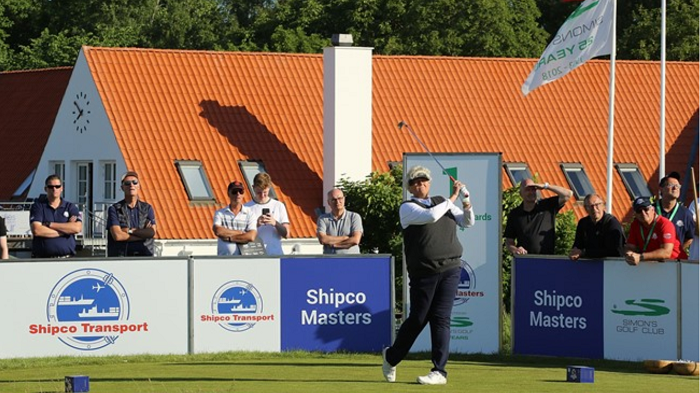 My old colleague on tour, Laura Davies, has been busy making history in Denmark by becoming the first woman to play in a men’s European Seniors Tour event. She finished 44th, beating Jose Maria Olazabal, Costantino Rocca, Gordon J Brand and Philip Walton, all of them former Ryder Cuppers. Fierce competitors as they all are, that must have smarted. 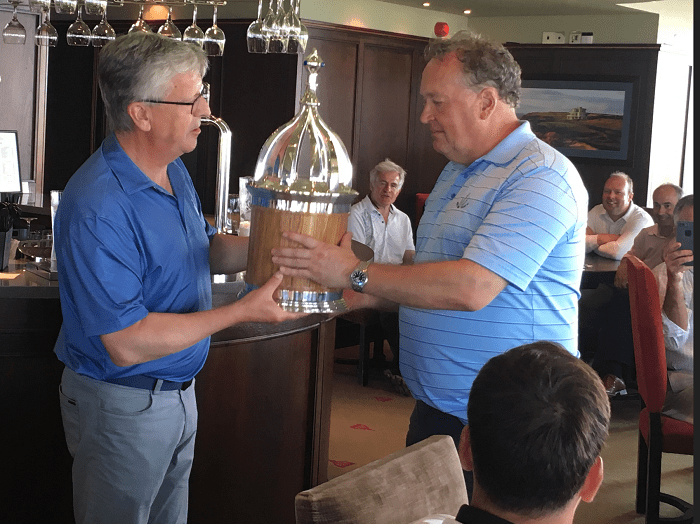 The competition was no less fierce at The Spire Trophy, an annual event held at the incomparable Castle Stuart Golf Links which, for the uninitiated, is situated five miles from Inverness, overlooking the Moray Firth. 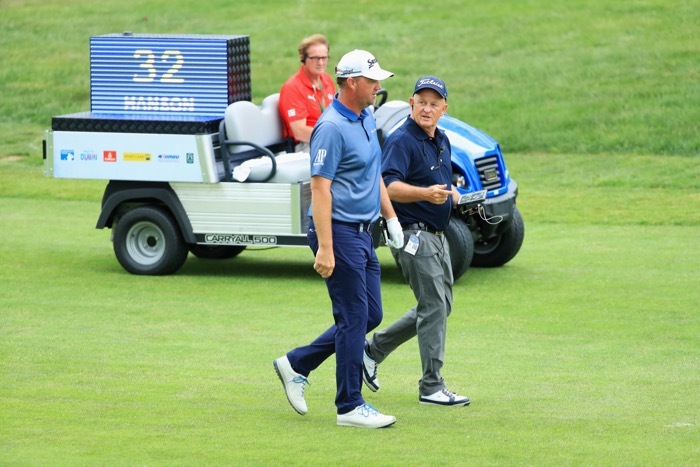 The match was the brainchild of Simon Chapman, a stalwart of Walton Heath Golf Club in Surrey and Stuart McColm, the general manager of Castle Stuart. Simon captains the visitors’ team, the Sassenachs and I was thrilled to be invited to play for the home team this year. Actually going to an airport with my golf clubs brought back memories of those faraway days of tournament golf. I must have got a little over excited because on the Friday I took full advantage of the superb practice facilities with Gillian Stewart who is the resident imparter of golfing wisdom. The shock of this unaccustomed practice was too much for my system with my back locking up completely so I was unable to play at all on the first day. 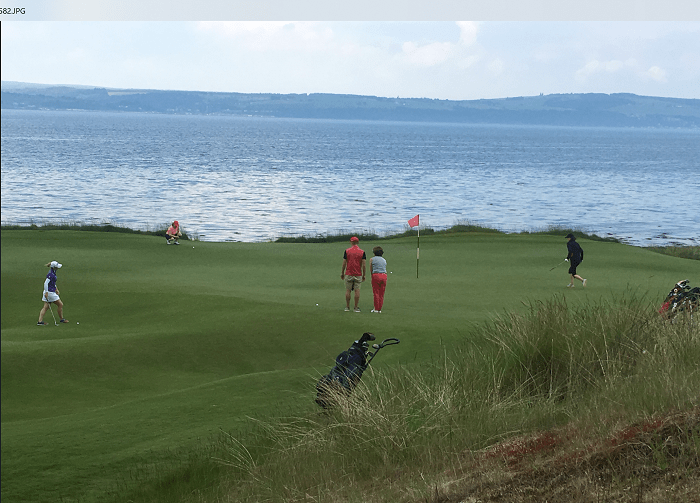 Castle Stuart – a lovely place to be whether playing or merely spectating. 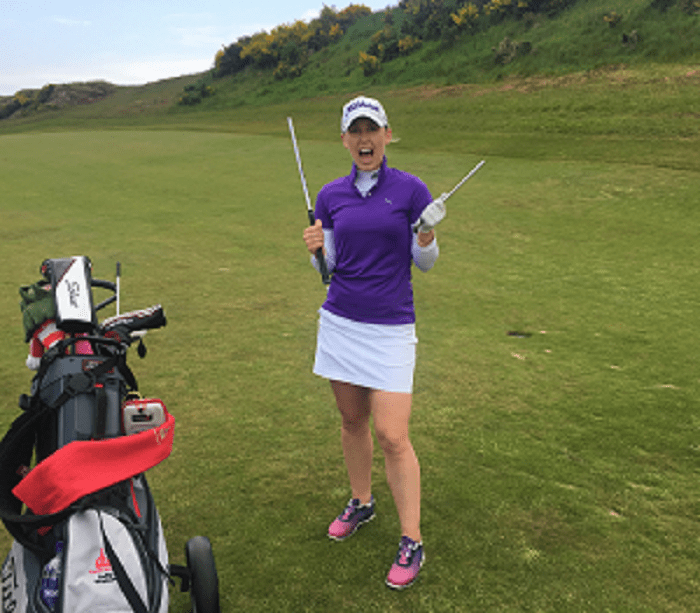 I did walk a few holes, however, and was delighted to catch up with former Scotland international Sally Watson, who after four years of professional golf has decided to return to her studies to pursue a Masters degree in Business Administration in Chicago. She starts her internship in a few weeks but rusty as she may have been, she still swings it impressively. 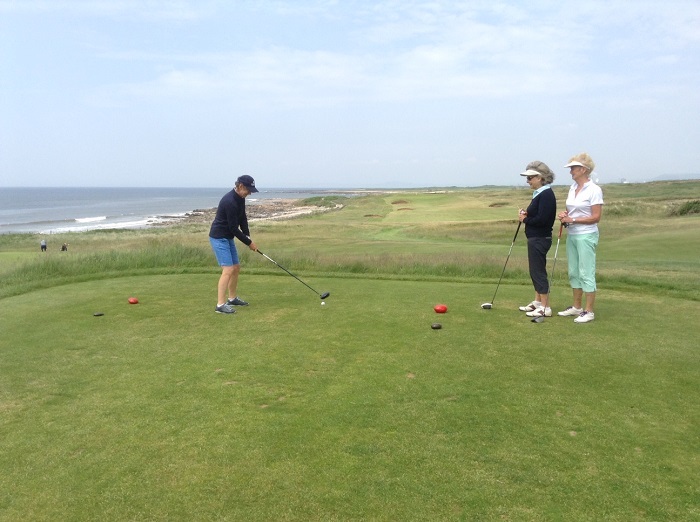 One foot in the business world but Sally’s still overpowering courses….and equipment! 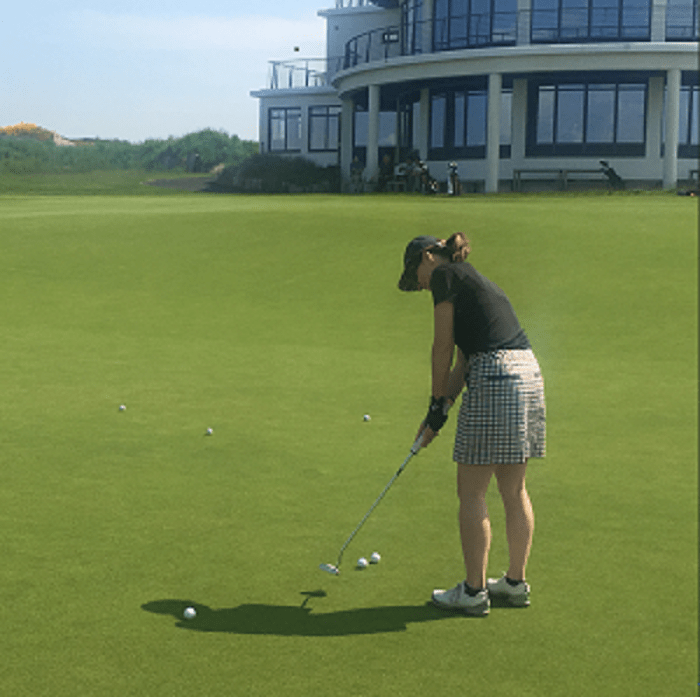 Stef Whyte, Marketing & Administration Manager of Castle Stuart hones her putting stroke before the off. The match was 20-a-side with fourballs on day one and foursomes on day two. I did manage to play on the second day and was carried round for the most part by my very able partner Jack Bonner, from Myrtle Beach. We were doing OK – 2 up with 3 to go – but were reeled in by the combined expertise of the London legal duo, Darren Almeida and Alastair Hodge, who won the 16th and 18th to halve the match. Overall, the trophy slipped neatly from the home team’s (the holders) grasp to that of the Sassenachs and our team captain Grant Sword dutifully tried to paste on a bit of a smile as he handed over the magnificent trophy. The Spire Trophy passes into the eager grasp of Simon Chapman. Royal Porthcawl about to be subjected to a barrage of birdies by our Welsh opposition. Alongside this classy golf there was also the little matter this past week of the US Women’s Open. The championship admirably splashed its way to an enthralling finish despite the atrocious conditions and serious amounts of rainfall. Ariya Jutanugarn, winner of the Ricoh Women’s British Open at Woburn in 2016, looked home and dry (figuratively speaking) with a 7-shot lead with only 9 holes to play. A triple at the 10th and a bogey, bogey finish, coupled with a closing 67 by South Korea’s Hyo Joo Kim, meant the new two hole play-off format would come into play for the first time. It took until the fourth extra hole before Ariya prevailed, doubling her tally of majors. Further serious stuff is on the horizon, with the men’s US Open, the second of their four majors, due to start next Thursday at Shinnecock Hills on Long Island, New York. More than half the field has to qualify through sectional qualifiers and for former Masters champion Adam Scott, World Golf Championship winner Shane Lowry and former PGA champion Keegan Bradley the challenge of the 36-hole qualifier was not something any of them relished. This trio was all successful but Bradley summed up the whole experience, “It’s awful, really awful. It’s humbling. We get treated so well on Tour, and you can kind of forget what maybe minitour life was like or even Web.com. This is a reminder of how hard you’ve got to work to be out there on the Tour.” I shall look forward to seeing them all in action next week in person. 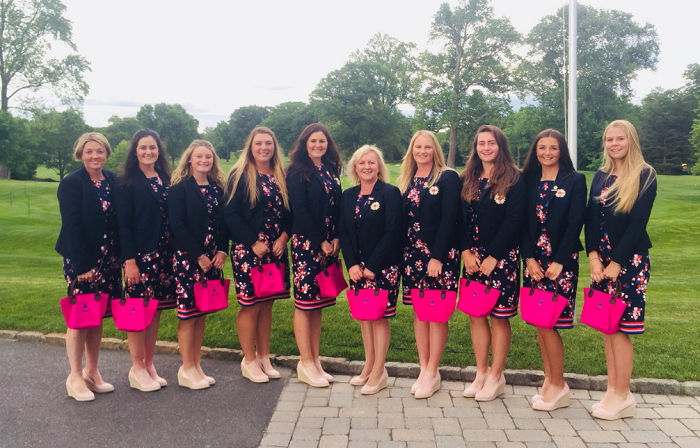 Finally, enormous luck to Elaine Farquharson-Black, who tweeted out the picture below, and her GB&I team who begin the defence of the Curtis Cup today at Quaker Ridge Golf Club against the United States. More of the same from Dun Laoghaire two years ago please. Slow play has become a habit, a bad habit if everyone who condemns it is to be believed and like all bad habits it’s a persistent little bugger, insidious and hard to get rid off, worming its way into our lives until we feel we can’t live without it. It’s seeped into golf over the years and nowadays a 4-hour round is generally regarded as positively speedy. There are exceptions but they tend to be last bastions. What happened to those carefree days – within living memory of some of us who still play – of skipping round in three hours or less? Of playing three rounds in a day? Guilty or not? Looks innocent enough to me. Someone said to me recently that the introduction of trolleys was the start of the slippery slope – no, that would be too fast, the slope must be sticky, gooey, glue-like, like wading through molasses – and I pooh-poohed that notion. But there might be something in it. The other week I played with someone who carried and I envied him his shortcuts as I manoeuvred my trolley around greens and other obstacles. So, perhaps we should be blaming Henry Longhurst’s mate Lord Brabazon of Tara, who, I believe, was the first man to use a trolley in this part of the world. Mind you, I don’t think the Brab, by all accounts a force of nature if ever there was one, ever hung about, ever. So, perhaps slow play is just an attitude of mind and we amateurs have been affected by the actions of others, the professionals who have nothing else to do but play 18 holes and, whatever their protestations, don’t care how long it takes. Long gone are the days when pros played 36 holes and still had time to get home and give a few lessons before dark. These days, after endless hours honing their skills on the practice ground, players tend to forget that Golf Is Not A Game Of Perfect (Bob Rotella) and expect perfection. They’ve taken to playing golf by numbers, joining the dots, forgetting that golf is, in fact, a moving game, that you can make decisions on the move, as you approach the ball, assessing, calculating, factoring in the breeze, whatever, so you’re nearly ready to hit your shot when you reach the ball. Sadly, the modern way is to start all the calculations when you reach the ball, bringing out the charts, or the measuring gizmos, consulting the caddies, or the stars and eventually, when all the post-discussion, pre-shot routines have been exhausted, hitting the damned ball. Or not, depending on your level of expertise. The European Tour, bless them, are trying all sorts of things to make golf more interesting and appealing to a younger audience with a notoriously short attention span. This week they’ve morphed the Austrian Open into the Shot Clock Masters and, lo, with the prospect of an immediate penalty of one shot for exceeding the designated time, everyone speeded up. Even notorious mañana merchants like Miguel Angel Jimenez, who likes to open a nice bottle of Rioja before assessing his options, adjusted with alacrity and no apparent dip in performance. He had a 67, five under par, one shot behind the leader Oscar Lengden of Sweden and breezed round the Diamond Country Club course in under four hours. 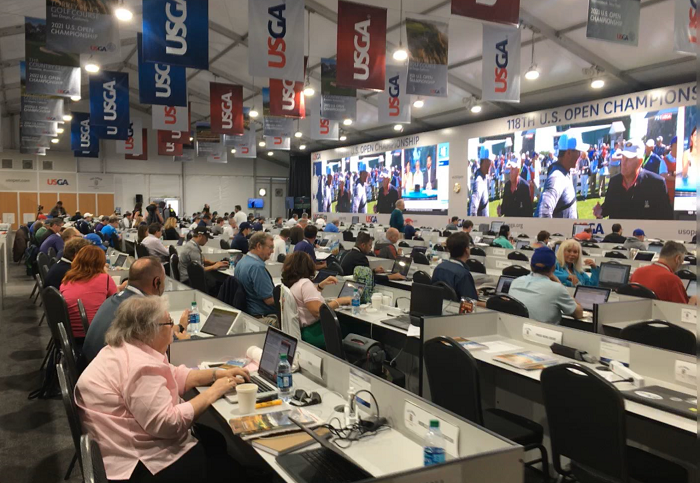 Every player was on the clock for every shot on every hole – there was a referee with the appropriate technology with every group – and the fastest round of the day was 3 hours 53 minutes compared with the 2018 season average (for a three ball over 18 holes) of 4 hours 48 minutes……..What was that about habits? The average for the first round was 4 hours 13 minutes and no one was penalised for a bad time. Wonder how long they’ll all take next week……. I’m running out of words – even this blog has its limits – but there are three important photos this week. 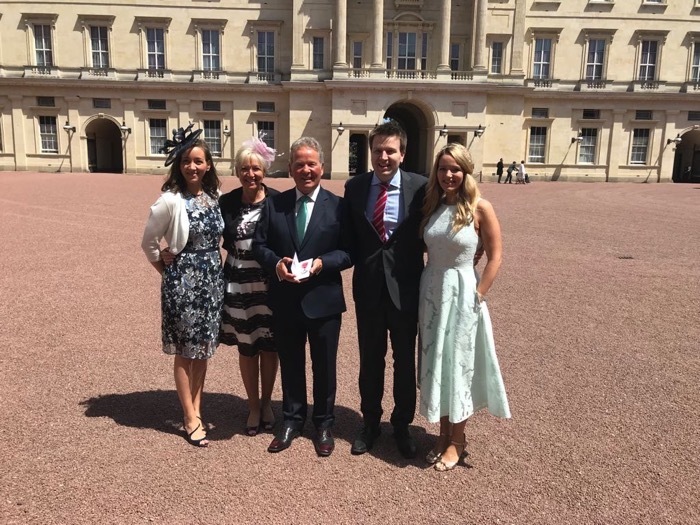 First, there’s the Moss clan at Buckingham Palace on Wednesday, where Michael, recently retired from keeping things in some sort of order at Portstewart GC, received a gong from Prince Charles. 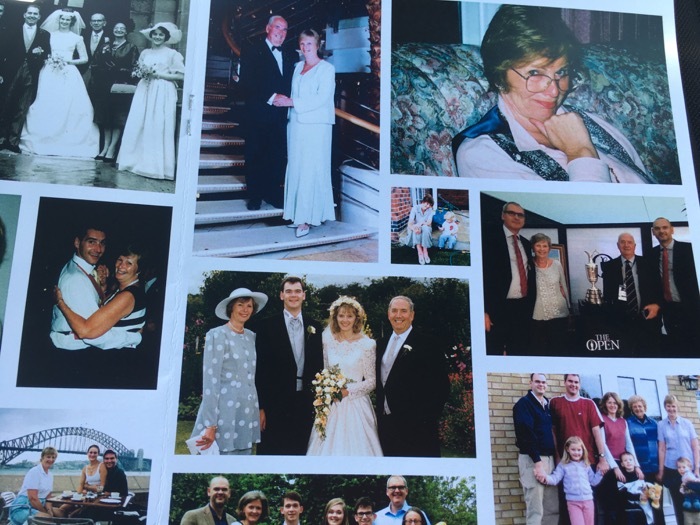 Next up is part of the photo montage that was the centrepiece of the order of service at the funeral of Angela Davies, wife of Bob (or John, depending on how you knew him). For years, every November, Angela, Bob, Dai and I used to drive over to Brancaster together for the annual Pat Ward-Thomas Trophy. 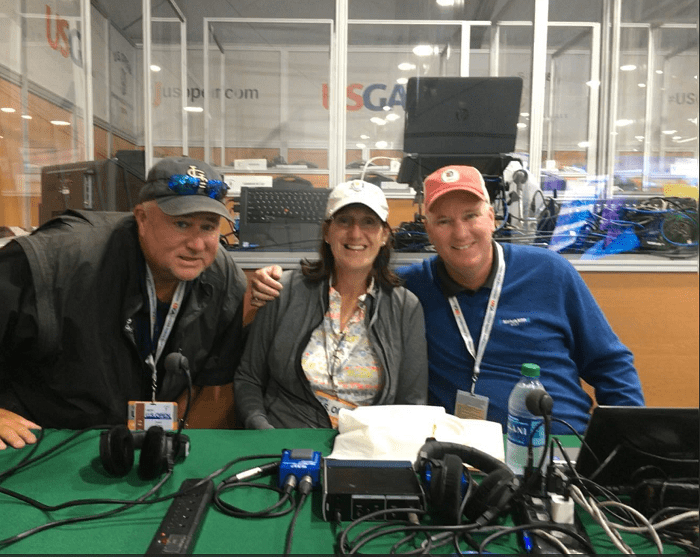 Angela was not a golfer but married to a man who followed the careers of Sandy Lyle and Ian Woosnam from their junior days in Shropshire to major triumphs in Augusta, she absorbed it all. She was a pillar of the local operatic society in Shrewsbury as a performer, choreographer and secretary. She was a formidable organiser but her real forte was people and we’ll all miss her. Angela through the ages. Her granddaughter Georgia said that she was well named: “an angel who had the kindest heart of anyone I have ever met”. Last but never least, there’s wee Mum, who would have been – well, I won’t say, because she hated people knowing her age; we only found out when she had to apply for a passport and it fell into the wrong hands! Happy birthday to everybody else who was born on the 8th of June. Mum sweeping one off the 1st tee at Portstewart. Note the size of the clubhead. And she was never slow.